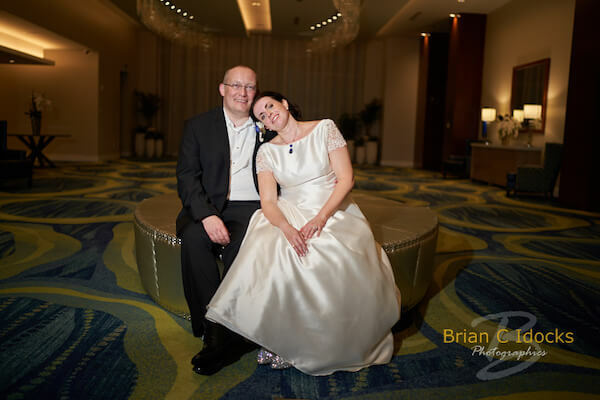 Lauren and Neil were such a fun and interesting couple for our Special Moments Event Planning team to work with. 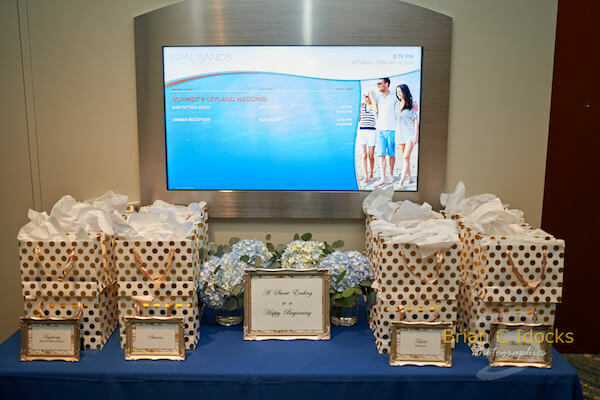 Lauren had a lot of the planning completed for their Opal Sands wedding on Clearwater Beach but primarily worked with us for guidance and vendor referrals as needed. 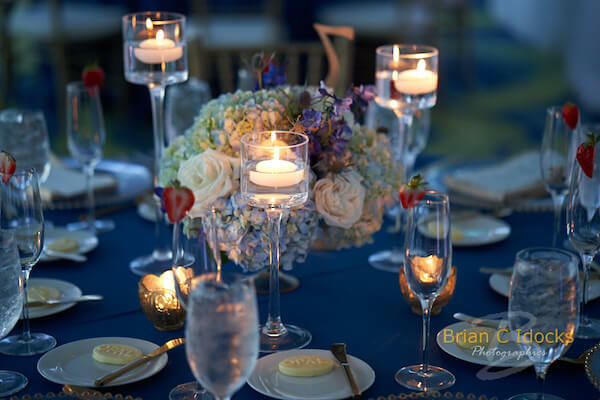 The wedding was created in a beautiful blue color palette that began with Lauren’s bridal bouquet and accessories. 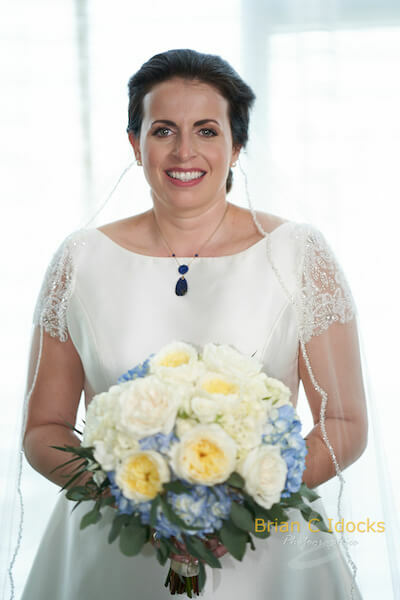 Blue tipped hydrangea, full white hydrangea and white garden roses paired with her blue pendant necklace. 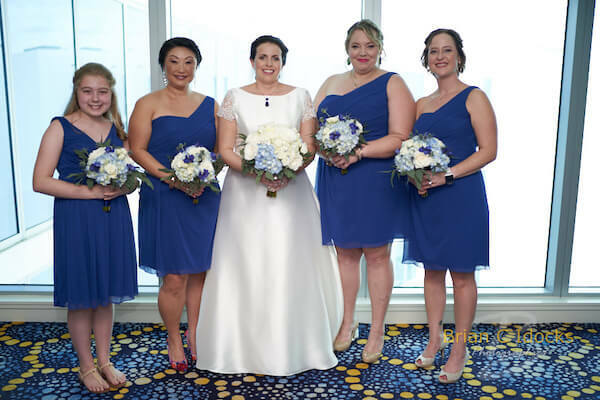 The blue color story carried through into their wedding party who wore bright blue tea length dresses and carried bridesmaid’s bouquets of hydrangea, blue delphinium, and blue thistle. 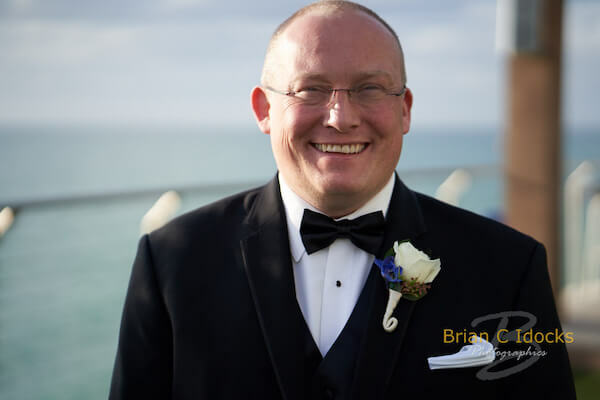 Dressed in a classic black tuxedo, Neil wore a white rose boutonniere with a touch of blue to tie him in with Lauren’s bridal bouquet. 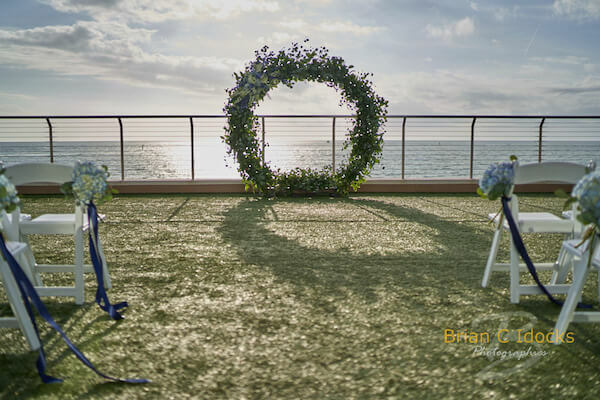 Their waterfront wedding ceremony was held just before sunset and incorporated a moon gate of fresh greenery with white garden chairs, white and blue florals, and long blue satin ribbon. 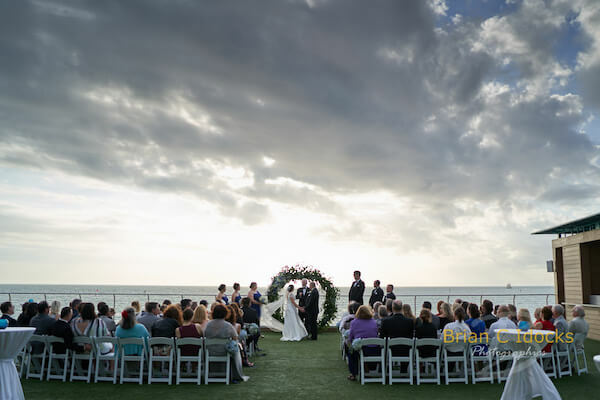 After their outdoor cocktail reception, guests made their way to the ballroom with floor to ceiling windows overlooking Clearwater Beach. 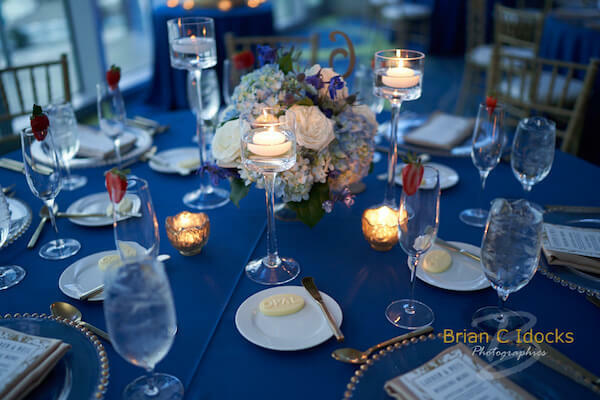 The tables were draped with royal blue linen with low blue and white centerpieces and floating candles. 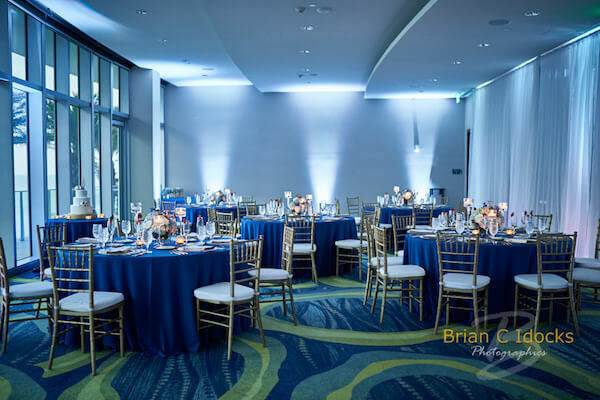 Gold Chiavari ballroom chairs, clear glass charger plates with gold beading, gold flatware and votive candles in gold-toned containers added another touch of color to the design. 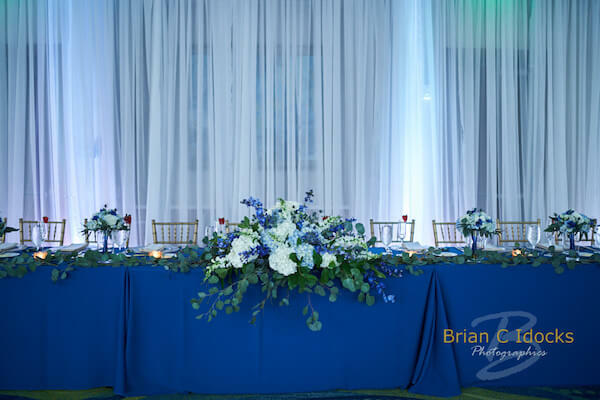 The bride, groom and wedding party were seated at a long table against a softly up-lit wall of flowing white drape, with a cascade of blue and white flowers. 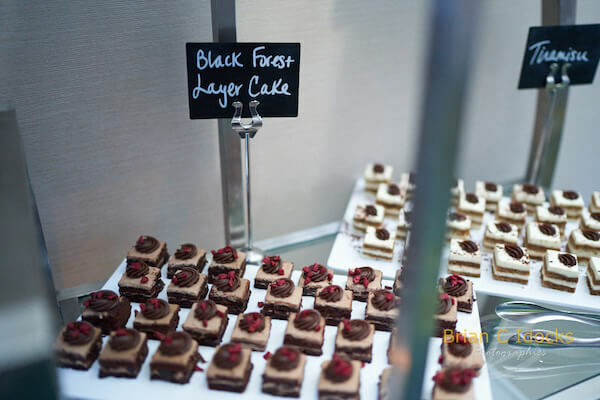 After the couple’s first dance, guests were treated to a gourmet five-course dinner. 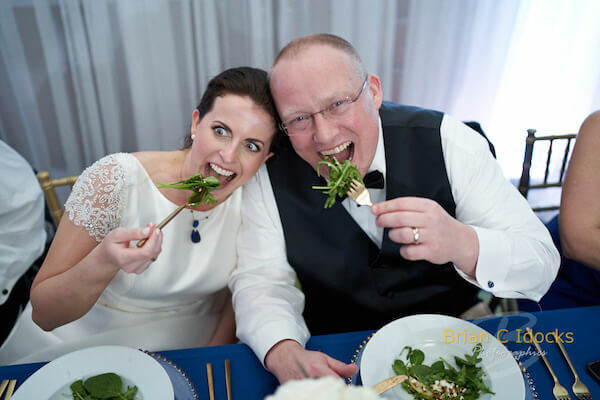 We love when a couple actually eats at their wedding reception, but we also really like when they have a great time and have fun. 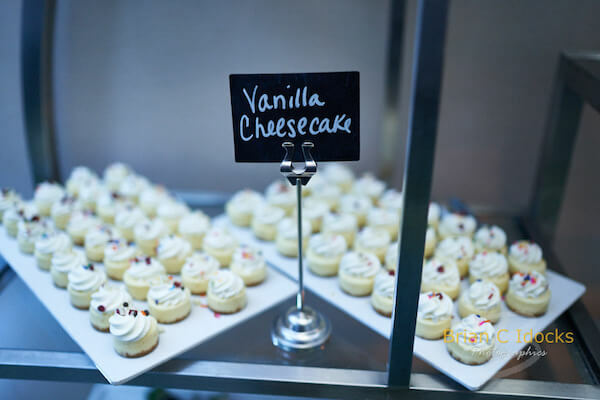 A separate space with a nanny service allowed the children at the wedding to pop in when they wanted a little break from the adult wedding festivities. 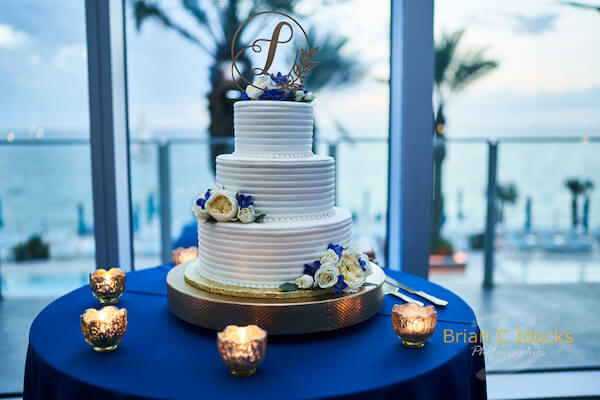 Lauren and Neil’s three-tiered white wedding cake was decorated with a custom monogrammed cake topper and blue and white flowers. 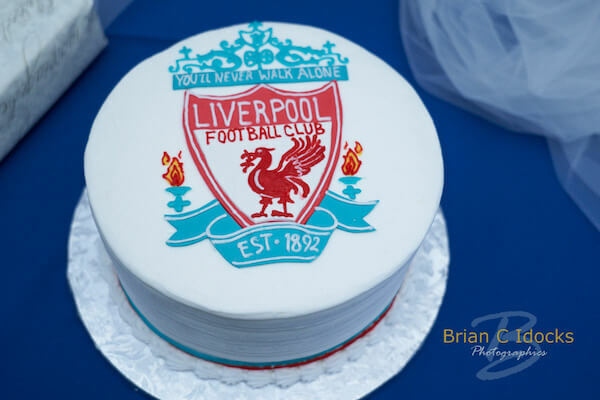 That was just the start of their sweet treats that included an amazing groom’s cake with a Liverpool Football Club logo and bite-sized sweet treats. Guests ended their evening on a really sweet note and were sent home with boxes of Girl Scout cookies. Somewhere there is one lucky Girl Scout! 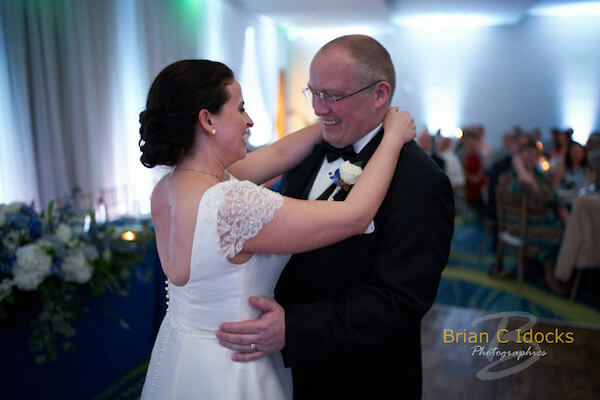 Lauren and Neil danced, ate and had the time of their lives with family and friends and ended their evening exhausted, but smiling. 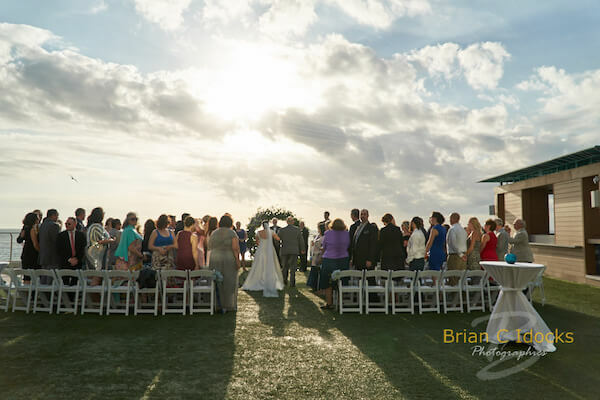 Thank you to the Clearwater Beach wedding vendors who made this day so amazing.